Well, this is a fun subject 😉 One of my first pairs has a very long break in time and I didn’t know what to do for shortening it. And I made some mistakes about it as well. We all want to finish break-in time as soon as possible right? So we can start having quality punching experience and feel “normal” with the pair. There are things which you can do for shortening the period and there are things which you should not do. Below you will find my researches and my experiences about the subject. Having boxing hand wraps is very important for safety and when you punch, it will increase the pressure on glove’s padding. And when the pressure is increased, this will shorten break-in time. After you wear a pair and if it is not tight then you can wrap your hands twice. However, if your pair is snug fit, then you don’t need to do it twice. Pair’s material is made for preserving its state. If you don’t use them regularly the break-in period can get longer. I experienced that when I used Cleto Reyes pair 2 times per week, the break-in period was 7 months. However, trainers in my new gym used same training gloves 3-4 times in a week. And they had 4-5 months of a break-in period. Regular usage will definitely shorten the time. Also, lots of people think that they should do heavy bag training for shortening this period. And it is actually better and provides a shorter period. 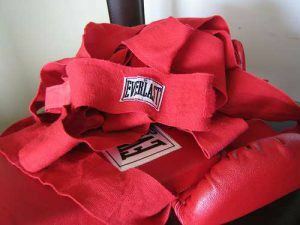 However, as long as you punch anything including pads, double end bag… the pair’s padding will have an impact and break-in period will be shortened anyway. If you really don’t like long break-in period you can always get synthetic leather gloves. Do these have break-in time? Some of them have however it is generally a lot less than real leather. Also if you don’t like break-in period definitely avoid handmade pairs, these can literally try your patience. It may even take 7 months to finish it. Important Note: Don’t close and open the front of boxing gloves. It can actually affect the padding and if you do it over and over again, the pair’s padding quality will suffer and it can shorten the durability. The padding is made for taking impacts and not for stretching. So many people put their pairs in a freezer to get rid of smell and bacteria. Actually, I tried and it works, however, I did not know that padding and material of pair can be affected badly by it. This forces gloves to stay in the preserving state. In that way, it can also extend the break-in period. There are cleaning ways which don’t harm your pair’s material. With these methods, you can also get rid of the smell and extend the pair’s durability. If you are interested, then definitely check out here. Should You Use Boxing Gloves with Long Break in Time? I actually love using quality gloves with break-in time. For example, after you finished Cleto Reyes training pair’s break-in time you will have amazing punching experience for a very long time. And you will get used to gloves. You might even get the same pair after that pair becomes useless. However, your glove’s leather may not have any quality. Let’s say it lasts a year and if this pair has break-in time around 4-5 months, then you will get same and quality punching experience only for 7 months. So you will only have good punching experience for a short time. Even though it can offer great punching experience, in my opinion, it is not worth it. If your pair has break-in time, glove’s durability is the most important thing. In my opinion, I should get same punching experience at least a year. Otherwise, it is simply not worth my money. 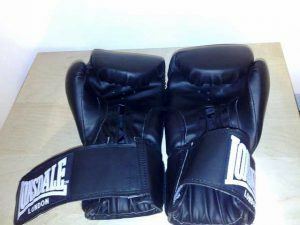 If you are looking for pairs with long durability and quality, have a look at these quality boxing gloves. 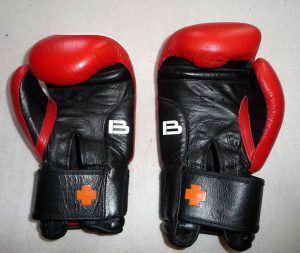 There are quality pairs for all needs including punching bag, sparring… And you can also see their break-in period and other unique features. There are many pairs on the market and I have used only 8 pairs in my life. I also searched online a lot about how to break in boxing gloves. However, I have not found anything about handmade sparring gloves. And I really would love to hear your experiences especially about sparring pairs. And if you want to finish this period faster, tips above will definitely help you. Also if you have any questions, just leave a comment below. Wow, I never knew that gloves could be damaged from freezing or cold temps. I like your tips on breaking in gloves. I have used Piranha brand gloves for a while and love the quality, I will have to use this tips the next time I get a new pair. Thanks! As far as I know, Piranha has quite a bit of break-in period. Did you use sparring or bag gloves of the brand? Hey Furkan, I learned a lot about breaking in gloves, like I didn’t know it was harder to break in full leather gloves and the cold was detrimental for gloves. What would you consider as the normal break in period for a good quality leather glove? Thanks for sharing. Obviously, it depends on the training frequency. How much do you use gloves? Do you punch the pads consistently etc? It also depends on the construction but it should not take more than 4 weeks.